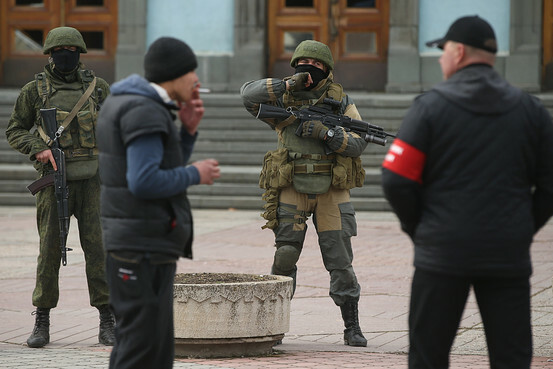 The U.S. and its European allies vowed Sunday to isolate Russian President Vladimir Putin and punish his nation's economy, demanding he withdraw what they called an occupation force from Ukraine's Crimean region. Washington began canceling joint economic and trade initiatives with Moscow, including preparations for the summit of the Group of Eight leading nations scheduled to be held in Sochi, Russia, in June. Senior U.S. officials said the administration was also beginning discussions with Congress on implementing targeted economic and financial sanctions on Russian companies and leaders if the Kremlin didn't begin pulling back from Crimea. "Russian forces now have complete operational control of the Crimean peninsula, some 6,000-plus airborne and naval forces, with considerable materiel," a senior official said. "There is no question that they are in an occupation position in Crimea, that they are flying in reinforcements, and they are settling in." Officials in Washington and around Europe were searching for penalties to impose on Moscow, while acknowledging military intervention wasn't among the possibilities.